1. Silver bullet for stress? Yeah…I’m gonna buy it. I inherited my mom’s type A-ness, and though I haven’t yet tried Badger’s Stress Soother, I’ve been eyeing it for months. Given our mom’s high stress levels, it was the first product I ordered for her this Mother’s Day (uh oh, hope you’re not reading this, Mom…SPOILER ALERT). This is an all-natural aromatherapy product that includes rosemary to promote clear-thinking, spearmint (one of mom’s fave scents – so much spearmint gum in her big magical purse!) for cheeriness, chamomile and lavender for relaxation, and more. Mom can rub on her hands or temples for a quick calming sensation. 2. Our mom went to great lengths for her beloved face cream. I’ll never forget how her “Mary Kay Lady” used to do drive-by drop-offs when my mom needed a new bottle in a pinch. She’d come in the middle of the day and leave a delicate pink satchel hidden among our front-porch shubbery…you know, so no one would steal my mom’s liquid gold (or maybe so neighborhood dogs wouldn’t eat it?). Not only did Mom teach us that landscaping can double as a lockbox, but spending some extra moolah on a face cream that keeps your skin looking and feeling its best is worth it. I received a sample of Osmia Organics’ Purely Simple Face Cream in a recent package and immediately knew this would be a new favorite for our mom (and for me!). With aloe and vegetable-derived glycerin (a favorite moisturizing agent of mine), it uses plant-based ingredients and a small amount of essential oils to keep skin spring-y and smooth, and is designed for sensitive skin. It has a refreshing herbal scent, smooth application, absorbs quickly and moisturizes all day. This face cream is perfect for all moms who are new to organic/natural products and don’t want to sacrifice the look and feel of their tried and true moisturizers. 3. When I think about our mom, especially during childhood, I think about her huge black purse that was full of wonder. Need some gum? Here you go. *pulls lint off of it* Need a tissue? Here’s a napkin from McDonalds. Have a cut? Here’s a bandaid and some Neosporin. Done. My mom taught me how to be prepared. How to think about everything I might ever need…and then put it in my purse. Mom told me to always have $20 in cash on me at all times. Just, ya know, in case. I cannot tell you often that wisdom has saved me from tricky situations. Or the cash-only taco stand. BUT STILL. IT HELPED. Anyway…enter Burt’s Bees Hand Salve. It makes me think of my mom because this is a great purse addition for all those moms (or anyone) who like to be prepared for anything! What I like about Burt’s Bees Hand Salve is that not only is it all natural, but you can get it in a pinch at the drugstore. It’s reasonable, and it’s something that she can use for a long time. It has a very herbal yet non-overpowering scent to it. It’s quite hydrating (you know I am all about the hydration) and the tin is just so cute. 15% off Tata Harper with code PureLove…awwww. **Zion Health’s body butters were generously sent to Kathryne for review by the product manufacturer. Check out our policy on product reviews. What are you giving your mom for Mother’s Day? Hugs is a totally acceptable answer. Ah, you must try Osmia! I JUST tried them out last month and was incredibly impressed. Now I know what everyone has been talking about all this time…their products are very gentle, have thoughtful ingredients and are packaged beautifully. They ship internationally, from what I understand! Thanks, Tania! Agreed – there’s something for EVERYONE in their line, especially among the aromatherapy products. Wonderful products! I am so having a love affair with Osmia right now. You need to try everything from them! SAME, SAME. That’s the goal! I could go on and on…and I will, in a future post! I’ve only tried/sampled a few items, so would love any recommendations you have for my next Osmia haul! Thanks, Chesca! 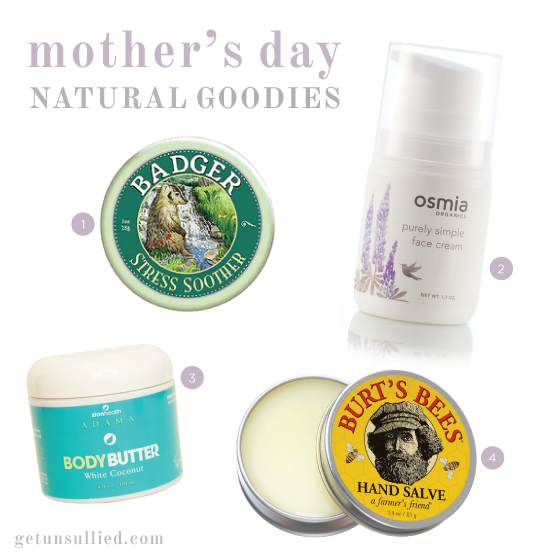 I had NO idea the UK + US had different Mother’s Days until we posted this article…will have to keep that in mind for our 2015 post, haha The Osmia moisturizer is my favorite pick – it’s a little indulgent, price-wise, but the quality of the ingredients is so high and the branding is spot on for Mother’s Day. I love it! I like Burt’s Bees salve and have used Osmia before even though it is a little pricey. This is the first time I have heard about Badger balm, sounds worth a try. I love how accessible Burt’s Bees is. They were one of the pioneer brands of the natural movement! I haven’t tried Osmia yet either, but I love Badger Balm, and I have only ever heard great things about all their products. Headache balm= brilliant!